Paul E. Hammerschlag MD, and associates at eight clinical centers around the United States are conducting a research study to compare the effectiveness of two different medications for treating patients with sudden deafness. Sudden sensorineural hearing loss (SSNHL) is an ear emergency in which the hearing in one ear drops in less than 72 hours. Prompt treatment with oral steroid pills, such as prednisone, can often improve the hearing. However, few patients make a full recovery. There are some indications that delivering steroid medicine directly into the ear rather than orally might work just as well and could avoid some of the side effects of oral steroids. The two drugs we are studying, oral prednisone and injectable methylprednisolone, are both well know anti-inflammatory steroids. Taking prednisone by mouth is common treatment for many conditions. However, injecting methylprednisolone into the ear must be considered experimental. There will be approximately 30 participants at this site and approximately 240 participants nationwide. The results of this study were just published in the Journal of The American Medical Association(JAMA): Rauch, S.D., CF Halpin, CF., Antonelli, PJ, Babu, S, Carey, J, BJ Gantz, BJ., Goebel, JA, Hammerschlag, PE, Harris, JP, , Isaacson, , B Lee, D, CJ Linstrom, CJ, Parnes, LS, H Shi, H, Slattery, WH, Telian, SA , Vrabec, JT, Reda, DJ Oral vs. Intratympanic Corticosteroid Therapy for Idiopathic Sudden Sensorineural Hearing Loss: A Randomized Trial. Journal of the American Medical Association, Vol 305, No. 20, 2079. 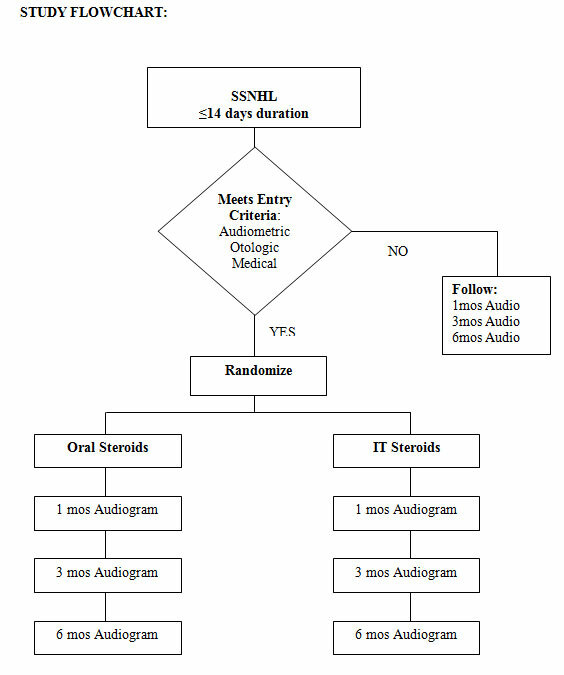 Participants in the SSNHL Study will be identified on the basis of their history of sudden deafness, a detailed audiogram (hearing test), and examination by a study physician. The study is summarized in the attached Flowchart. All participants who meet entry criteria and give informed consent will be randomized to receive one of the study treatments, either oral prednisone for two weeks or a series of methylprednisolone ear injections over two weeks (4 doses total). Randomization means that neither you nor your doctor can choose which treatment you will receive. Instead it will be determined by random choice, something like a coin toss, and assigned by the Study. Four weeks after enrollment (two weeks after completing treatment) participants’ hearing will be retested to determine the effect of treatment. All participants will be seen for follow-up and repeat hearing tests again at three months and six months after enrollment. In addition to hearing tests at four weeks, three months, and six months, participants will be asked to complete a brief questionnaire at each visit detailing their general health and any symptoms or side-effects related to the treatments. otitis media: middle ear infection with ear pain, hearing loss, possible ear drainage. The SSNHL Study has been reviewed and approved by the Institutional Review Board (IRB) that oversees Human Research Studies at each of the collaborating medical centers.